Small to Medium sized businesses shouldn’t have to shell out a few thousand a month to have a third party track their invoices. If your company is local and works personally with consumers, doing your own invoices can be cost-efficient and time saving. The Easy Excel Invoice Template helps businesses track their consumers purchase(s) with ease, making the process a breeze for both business and customer. Using the link below, download the template and open it to a pre-populated one page sheet organized for easy viewing. At the top, enter the date and invoice number for this particular transaction. On the far left side column, enter the billing and shipping address (if needed) of the consumer. Below that, make your company name where the bills are payable to along with your name, address, and phone number. With this, the bottom horizontal column should contain all of your company information contact and location information. Moving onto the middle portion, fill in the “For” section with a brief description of what the charges are for. The cells below are for item numbers (if applicable), a short description of the purchase, the price, quantity, and finally the total amount will be calculated for you automatically (no math needed). The bottom will show your subtotal along with the amount of items purchases. Right below, don’t forget to adjust the sales tax rate to match your area. To the right, the only part you need to enter is the deposit received if applicable. The sales tax and invoice total is already calculated. That’s all there is to it! Underneath the “Invoice Total” is “Due Upon Receipt”. You can change this to whatever your due date is. Save digital and printed copies of these invoices for two years to help with taxes and any consumer questions. 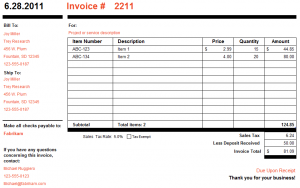 Offer to send the consumer a digital copy of their invoice along with the paper one. Always fill the invoice digitally to avoid fraud or unauthorized changes.